This gem of a story is a bite-sized slice of classic Who that made me grin throughout. If you haven’t sampled one before, you need to know that Short Trips are audiobooks told in third person narrative, not dramas trying to recreate live action through sound. Author Nigel Fairs makes the best of the limited medium by serving up a simple plot, using most of time’s canvas to delight us with impressionistic but vivid imagery, nightmares, and some insightful thumbnail portraits of classic characters. Once again, I’m struggling to avoid spoilers, but everything and everyone on the cover is in this story. Aboard the Overcrowded TARDIS, Nyssa decides to take a break from playing mediator and exercises the right of all proper Doctor Who companions to poke her nose into trouble. At first, she’s remembering Traken. Nyssa-fans are given a rare treat: we learn more about her family life in a few minutes than we did in all her TV episodes put together. Then the nightmare spills out into the TARDIS— or does it?— and she blunders into a terrifying mini-adventure. Sarah Sutton outdoes herself by imitating several Who actors she’s never met or at least never worked with. Nyssa doesn’t recognise them, but classic Who fans will have fun picking out who’s who. What’s real? What’s illusion? She’ll need her own Doctor to make sense of it all. Hopefully this homage to several eras of classic Who will entertain fans unfamiliar with this companion. Fans who actively dislike Sarah Sutton will have to sit through one of my very long fanwank essays may not find enough in this audio to satisfy them. *Hey! I searched for The Toy on Big Finish and couldn’t find it! This audio is an exclusive “subscriber gift” bundled with an online subscription to The Complete History of Doctor Who. In fact, The Toy was originally announced as part of the Monthly Short Trips for May 2015. Sarah was apparently strong-armed into recording another one, King of the Dead (good, but not quite as interesting). While several Big Finish audios started life as Doctor Who Magazine subscription bonus for Doctor Who Magazine and were released many years later on Soundcloud and/or Big Finish, I have no idea if Complete History will ever follow suit. Update Fall 2016: The Toy has now been re-released as a digital download. 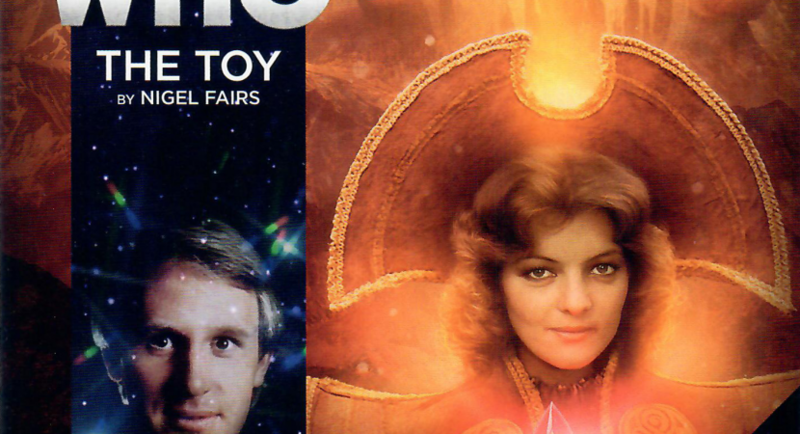 But you don’t get a CD or a cute cover with Nyssa dressed as a Time Lord. As usual, I was dancing all around spoilers above, so let me add a few more thoughts. I loved the backstory almost more than the story: Nyssa and Tegan’s roommate habits, the explanation for why they never change their outfits, fleeting references to Nyssa’s mother and Trakenite flora and fauna, and of course, the fantastic echoes of Susan and Gallifrey and all the Master’s incarnations. The scenes between the First Doctor and Susan were so touching and warm that I almost thought this might have been written for Carole Ann Ford. The tiny glimpse of the Doctor’s circle of friends, with him and Susan both dressed as Prydonians, was wonderful. I also love the way this script brings out Nyssa’s haughty naiveté. Only the rich leisure class can afford to fantasise about the lives of servants, like Marie Antoinette dressing up as a milkmaid. Sarah Sutton really worked to capture the voices in this one. Some of it works better than others, but I was tickled pink by her Hartnell imitation, and she doesn’t do a bad job with Pertwee or Tom Baker. I don’t think she studied Delgado; for that one she’s back to her Damasin Hyde voice from The Darkening Eye. It’s really sweet that Nyssa’s finally discovered Susan. It flatly contradicts The Five Companions, where she’s never heard of Susan before. Doctor Who contradicting itself? That, too, is classic Who. My one and only quibble besides the strained Facebook joke is that I think Nyssa is too honest to conceal the star map fiasco from the Doctor. Hopefully that was just a simulation (or a video game) and had no impact on reality. But surely, in light of Traken’s fate and Nyssa’s strong ethics, it would weigh on her terribly. I think she’d want to confide in the Doctor so they could investigate and try to fix the damage. I suppose she is still extremely young in this story. Obviously, this is Season 19, probably post-Visitation since Tegan’s not trying to reach Heathrow any longer. (She reminded the Doctor she had decided to stay in Black Orchid.) Nyssa’s been aboard long enough to have become the mediator and fallen into a routine with Tegan as her roommate. Also, Nyssa observes that Adric’s been “distant” lately, which sounds like it’s closer to Earthshock, when he was getting fed up.